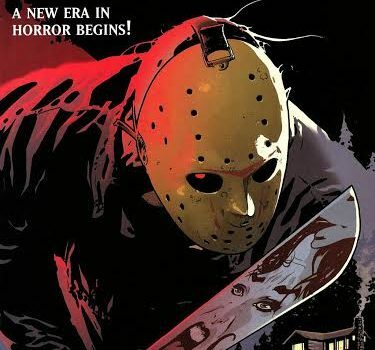 There had been Friday the 13th comics before this, with Topps comics releasing an adaptation of Jason Goes To Hell and a crossover with another franchise in Jason vs. Leatherface, and a couple of short runs from Avatar featuring Jason in both great regular and new Uber flavours. These titles are the ones I’m most familiar with, and that’s what I’ll be discussing here. Jason’s time at Wildstorm, though short, was his most productive time in comics with 13 issues of just Friday the 13th, and 2 6 issue miniseries of Freddy vs. Jason vs. Ash. It’s the solo material we’re going to be discussing here, starting with the initial six issue miniseries entitled just Friday the 13th. The first issue introduces us to our cast of late teens/twentysomethings, a mixed group in terms of race and (as is eventually revealed) sexuality, who have come to help get the old camp cleaned and reopened. We also have an introduction to the disastrous history of the camp itself, and (unfortunately) two misspellings of the main character’s surname in the space of two panels. Over the next few issues, we get to know the characters a little better mainly through interpersonal conflict, we get a little more of the history of Crystal Lake, a few false alarm jumps and some well-timed and reasonably well executed death scenes. Palmiotti and Gray make a decent stab at telling a new story in a well-worn series without it feeling quite as formulaic as Wildstorm’s Nightmare on Elm Street title. This does at times read like an adaptation of a reasonably good entry in the series. Unfortunately, it falls down whenever they stray too far from the well-worn path of the movies, attempting to graft a whole new tragic history onto the Camp Crystal Lake area before Jason’s arrival. This could have worked, and would have added a whole new dimension to the saga, had it been played a little better. 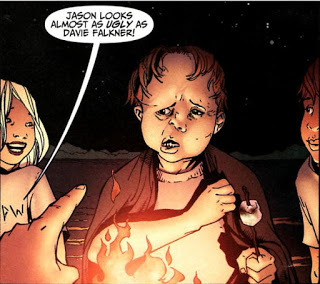 Instead we get levitating zombie children rising from the lake and a bizarre and suddenly introduced concept where Jason is the vessel of the anger and hatred of a murdered shaman. Archer and Guzman’s artwork, while a little cartoony at times, does bring a certain youthful vitality and energy to the book, along with possibly some of the most buxom women in comics. Their Jason is tall and broad, resembling Kane Hodder’s take on the character in the later movies. 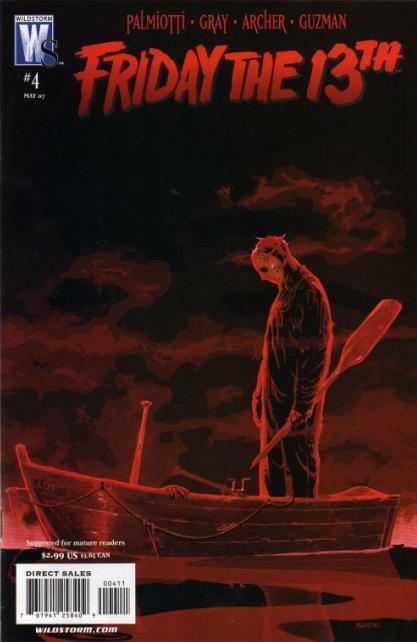 The most impressive aspect of the storyline is probably the covers by Ryan Sook, with special praise going to issue one’s shot of a machete-wielding Jason, the face of his next victim reflected in the blade, and issue four’s moody, blood-red portrait of a post-kill Jason on a rowing boat. The forthcoming TPB collection of the storyline therefore is cautiously recommended. There’s a passably entertaining Friday The 13th story in there, if you can wade past some of the missteps. I reread the series recently, and several years on, I pretty much stand by that – except the artwork really has grown on me in that time, and I guess that the levitating zombie children and shaman anger isn’t the worst idea the franchise has had to deal with. Oh, and that’s Ken Kirzinger’s Jason, not Kane’s. After the initial six-issue miniseries came a run of three two-parters. Marc Andreyko and Shawn Moll were first, with Pamela’s Tale. As the name suggests, it fills in the gaps in Pamela Voorhees’ life before the first movie and shows us a pre-drowning young Jason. 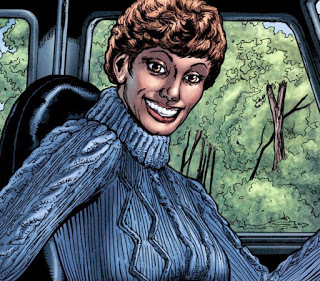 I’m not as keen on Moll’s artwork as I was with the Archer/Guzman team, but he certainly catches Betsy Palmer’s toothy smile. I’m not completely sold by their take on young Jason – the reason Pamela has to take him to the camp with her is because he’s been torturing small animals. On the one hand, that’s a common fictional shorthand for “grows up to be a serial killer” – but I’ve always thought of young Jason as an innocent until he was drowned. Barring that personal taste issue, the story works well and would make an excellent original streaming movie. Next comes my favourite, Jason Aaron and Adam Archer’s How I Spent My Summer Vacation. Young Davie Falkner has the bone disorder craniodiaphyseal dysplasia, and the facial deformities it gives him lead him to be mocked and bullied by his fellow campers. Thankfully, Jason kills them all but leaves Davie alone. So Davie follows Jason around, and Jason kills a bunch of other people, and there’s a sheriff on meth and a helicopter, and… just read it, OK? After that, it starts to fall apart. Ron Marz and Mike Huddleston’s Bad Land juxtaposes the story of three fur trappers 250 years ago and a group of hikers in present day Crystal Lake. It’s set in the depth of winter, a massively popular fan idea. Unfortunately, the execution isn’t up to much – both groups needing to take refuge could have happened in a summer storm, and nothing much is done with the snow beyond that. Also, the story of the fur trappers functions mainly as a distraction and Huddleston’s art doesn’t really suit the story. Finally, there’s The Abuser & the Abused by Joshua Hale Fialkov and Andy B. A story of a teenage girl taking her revenge on those that have done her wrong, including her stepmother and her boyfriend. Then along comes Jason… it’s not that bad, but would work better with a generic Jason-esque slasher than the real guy. So, apart from the two FvJvA minis, that’s it for Jason in comics. 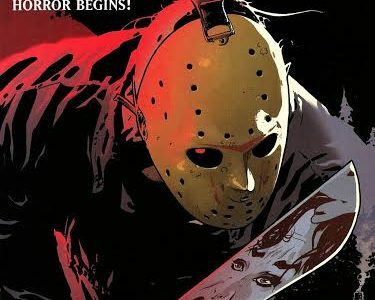 A pity, really – there’s not enough slasher action in comic books and Jason works better in the format than some of his contemporaries. It looks like if I want to see slasher comics, I’ll have to write my own. The Dark of the Forest and Deadly Burlesque are both available on ComiXology, and Slashermania is due by the end of the year. Russell Hillman writes and self-publishes comic books under the Freaktown Comics banner - you can find them on ComiXology, if you look. He lives in England with his wife, reads too many books about slasher movies and drinks tea in vast quantities.